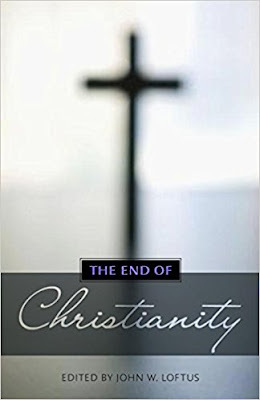 stylos: An atheist accurately describes "the end of text criticism"
An atheist accurately describes "the end of text criticism"
I recently ran across the neo-atheistic anthology The End of Christianity (Prometheus, 2011), edited by “deconverted” (we’d prefer “false professor”) former pastor John W. Loftus. One of the chapters is Hector Avalos’ “Why Biblical Studies Must End” (pp. 107-130). Textual criticism is the scholarly discipline that seeks to reconstruct the most original text possible for any particular written work. Such a discipline, therefore, is not restricted to the Bible.… Unlike most works of antiquity, however, the textual criticism of the Bible carries crucial theological and moral consequences for those who believe they must have an accurate record of God’s word to guide the conduct of their lives. Yet, in the past few decades, there have been some prominent textual critics who have worried whether this field will survive…. The findings of textual criticism devastate any claim that the Bible has been transmitted faithfully from any original text….. Textual criticism, in fact, has helped destroy any notion that there was ever a stable entity called “the Bible.”…. The “original text” proves to be a mirage unless we have access to the entire transmission process from inception to current copy. Such access is something we don’t have, and probably never will have in the case of the Bible…. Textual criticism has made important contributions to our understanding of the Bible. However, those contributions have spelled the end of textual criticism. Historically, the primary goal of biblical textual criticism was to reconstruct the original text. Textual criticism has shown that this is impossible. Thus, textual criticism has ended in that sense. Textual criticism of the Bible becomes more than ever an elite leisure pursuit that will have difficulty asking taxpayer and churchgoers to continue funding an endeavor that brings joys akin to solving Sudoku puzzles but provides little benefit to anyone else. This atheistic writer sees clearly what many contemporary evangelicals who continue to embrace the modern critical text and the method that produced it do not. Namely, that modern text criticism is a foe and not a friend to confessional Christianity and the authority of the Bible. It was based on a effort to reconstruct the original text, an endeavor which has now been abandoned as hopeless. It is an “elite pursuit” that yield little benefit. Amen! I just finished reading the linguistics evidence section of Nicholas P. Lunn's "The Original Ending of Mark", which is a fascinating read, but the practical atheism which idrequired to argue within biblical academia is very troubling. Please excuse my orthography. Thanks for the comment. Glad to hear you've been reading Lunn. Yes, it's amazing to see how much the "assured results" of scholarship depend on one's presuppositions. If you assume Mark 16:9-20 is not original, you find reasons to believe this. And many of those presuppositions are based in naturalistic assumptions, hostile to the traditional Christianity. Jeff why is the CT accepted in reformed denominations as well as seminaries such as westminster(east) and RTS? From my understanding the RSV was rejected for a long time by conservative reformed evangelicals. Why the sudden change in direction? John James: Good question. And Hugh has succinctly given part of what, IMHO, is the answer. To which we might add: Relentless and vigorous Enlightenment-influenced promotion of the critical text and modern translations based upon them (see Metzger), evangelical accommodation to and appropriation of modern text criticism (see Warfield and Robertson), the construal of "inerrancy" (of the autographa) rather than "infallibility" (of the apographa), reaction against the reactionary KJV-Only movement, and the desire for academic and intellectual respectability.